The Center for Arab-West Understanding (CAWU) has seen a significant increase from 18 interns in 2017 to 53 interns in 2018. For many years interns have found their way to us by means of the internet or by word of mouth. However, in March 2018 we agreed with the AIESEC (Association Internationale des Étudiants en Sciences Économiques et Commerciales) to accept student interns coming through their organization. In 2018 twenty students came through AIESEC. They included students from India, Bolivia and Mexico, students from countries that we would rarely attract through our own network. That diversity was greatly welcomed. Ten students, all through our own network, came from Egypt. These youth will be the leaders of tomorrow. Students all benefited from the very international atmosphere in our office. Students have stayed between one month and one year. Our database makes it possible for interns to work on a very large number of subjects. Since our database is strongly focused on the role of religion in Egyptian society it is not uncommon that many interns have worked on subjects relating to this topic; although it has never been seen as a requirement. However, it is required that the students are in Egypt to learn and thus all work must be descriptive. They must also have no engagement in political activism and no participation in lecturing others on how Egypt should or could be better. 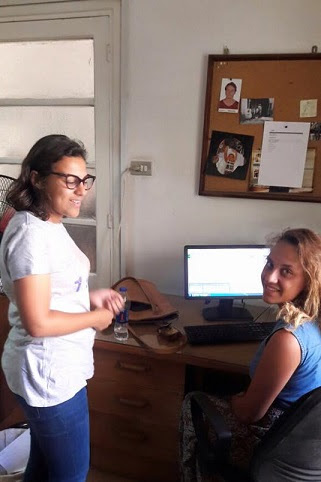 Some examples of the work done by our interns include: journalistic projects, research, improving their writing skills, studying Arabic, summary translations for our database, and managing our Facebook pages. Student internships need to be a good learning experience for the interns, while also proving texts for our database. Thus, we organize meetings with interesting Egyptians and at times provide side-visits to locations of interest. These meetings and visits benefit the students, but ideally they should result in one or more texts for the database. Students have also contributed to our new Learning Center for children and youth who never had an opportunity for regular education and other social activities. We don’t pay the students for the work they do (anyhow we would not have had the funding for this) and neither charge students for the facilities we provide, since it would turn away a large portion of students. It is enough for us that the students contribute to our database and/or the social projects our NGO is engaged in. This database is a true treasure house for most student interns, as it provides data in English on contemporary Egypt that one would rarely find elsewhere. Students benefit from previous work and often build on the work of previous interns. It is obvious that the internships are highly beneficial for most interns. In the past years, we have written hundreds of recommendation letters for further studies, scholarships and jobs. Shen Shangyun from China, who interned with us from the summer of 2006 to the summer of 2007 obtained a scholarship from universities in Europe thanks to his work with us on the Egyptian Holy Family tradition. Seok-jo Noh came in 2008 and was our first South Korean intern. His English writing and language skills were not the best, but his video taped interviews and photography were excellent. He became a well-known Middle-Eastern correspondent for Korean media. In 2010 Seok-jo wrote about the importance of his internship with us and how it has positively impacted his life since. I met him again in 2017 and he reconfirmed the importance of this internship for his later career. We had no idea what he wrote in 2010 until Korean student Jiyeon Cheon translated this for us. For the full text of his experiences please click here. In July 2018, Italian journalist Giulia Cerqueti wrote about the experiences of four previous interns from Italy. They have all benefited greatly from their internship with us. For the translation of Giulia Cerqueti’s article please click here. This article has led the Catholic University in Milan to encourage students to intern with us. Working with student interns is great. They have chosen to intern in Egypt and thus are always well motivated. They are also eager to learn, therefore we show them that reality is always more complex than what many media portrays. The new year won’t be easy. On one hand we are seeing a rapid increase in internships while on the other hand our contract with Misereor is ending July 1st. We hope and pray that we will find the funding to continue our work with student interns in 2019 and years to come. It is obvious that working as a small independent organization is difficult and therefore we are looking for cooperation with the Heliopolis University for Sustainable Development (HU). On March 26 we presented our internship program to the HU and signed a memorandum of understanding for future cooperation. In the summer of 2018 we organized a summer school with the HU. On December 27 we signed an agreement for further cooperation with the HU that aims at bringing our interns to HU. We are also planning a new summer school in cooperation with HU. These are all activities that will intensify our relations with the HU. Of course, we will need funding to keep our internship program going but we are confident that the cooperation with HU will provide new opportunities and reach even more students with our message of respect for diversity and intercultural cooperation.